I have enjoyed watching and feeding birds for over 20 years. Growing up along the Mississippi River, I landscaped the backyard each fall, observing birds for hours from a small shed. I began creating and installing new feeding stations and experimented with a variety of feeders and special bird seed blends. To help attract an even wider variety of wildlife, I planted trees, shrubs, flowers and provided water year round, all of which resulted in a large increase in both the number and variety of birds at the feeders over the years. I graduated from Brainerd’s Central Lakes College with an A.A.S. degree in Natural Resources, transferring to Northland College in Ashland, WI to obtain a B.S. degree in Natural Resources Management. I participate in Project Feeder Watch, a citizen science project from Cornell Lab of Ornithology. My positions in natural resources included working for the US Fish & Wildlife Services (USFWS) and US Geological Survey as a Biological Science Technician. As a technician at Rice Lake NWR in McGregor, I conducted breeding bird and waterfowl surveys and designed feeding stations for the visitor’s center. While working with the Kirtland Warbler Recovery Project in MI, I led numerous tours for the public throughout the area to view this endangered species and its habitat. Working for several years at a retail bird store in Minneapolis has further expanded my product knowledge of bird feeders and feeding supplies. 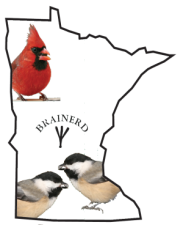 MN Backyard Birds is a new and unique birdscaping business servicing the Brainerd Lakes Area which professionally designs, installs, and maintains bird feeding stations at your home, resort or place of business. This service is designed to enhance and create more opportunities to view birds and wildlife. This new service will provide customized feeder packages which include professional installation and maintenance options to provide worry free enjoyment for viewing birds and wildlife. Customers can choose from a variety of hand-crafted and recycled bird feeders and service package options.